Dislikes: Loud noises – puppy mill life was scary all the time with loud noises, but I’m getting better knowing they aren’t going to hurt me. Hi, I’m James Dean or JD for short. My foster mom says I’m a handsome devil, even after the vet pulled a bunch of my teeth. I really love being with my foster siblings, although I don’t really play with them. I just like sitting or laying next to them. I’m not house trained yet and I have to wear a belly band, but I’m doing lots better and will go outside and go potty when everybody else goes. My foster mom says I’m pretty low maintenance. I like sitting next to her or my foster dad, but I’m happy in my bed too. I don’t bark much, even when my crazy foster sibs bark. I’m not really sure what they’re barking at. I have a foster cat sibling, but he doesn’t bother me any. I got neutered a week or so ago, but I forget and I try to mount my foster sibs. Mom is working with me on that cause my sibs sure don’t appreciate it. I think I’d be happiest in a home with another dog cause I really like the company. I sleep in my crate at night. It doesn’t bother me any. I like to eat and my foster mom says I don’t have any food aggression. I still get scared sometimes when I hear loud noises, but I’m getting used to it. I can do stairs and I ride in a car well. I don’t mind a lot of people in the house, as long as they let me approach them first. I would sure love to have a family of my own. Please? Interested in adopting James Dean? 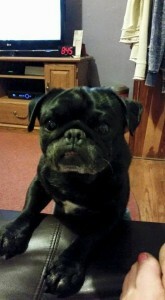 Please see our website and fill out an application at: www.pugpartners.com/adoption-application James Dean’s minimum adoption donation is $325.